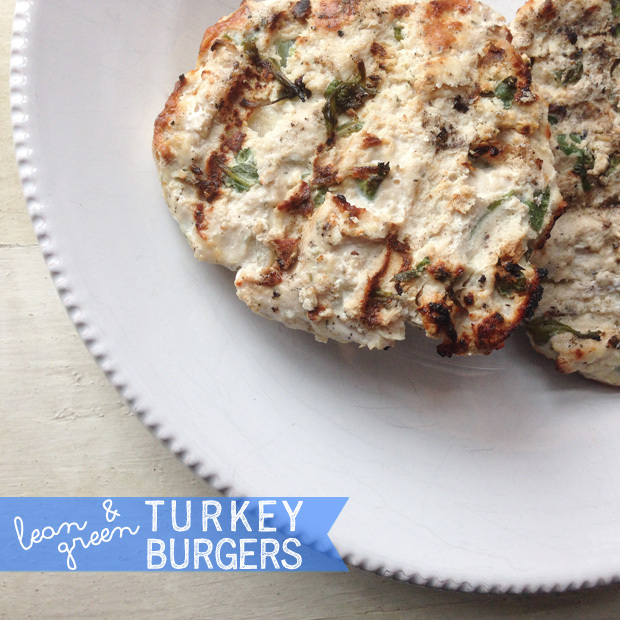 Lean & Green Turkey Burgers! Lately I’ve been eating grilled chicken like its my ‘yob’. We usually grill on Sunday and by Wednesday/Thursday we’re at it again (still not sure how two people eat as much as we do, cause I feel like I’m always going grocery shopping). Also, I say “we” but let’s be real, this guy is the one doing all the grilling. I mean why get in the way of a good thing right? Pretty sure he’s got the whole grilling thing on lock. Anyway, grilled chicken breasts are a staple in my diet…but variety is the spice of life! That being said, I’m working to apply this to my own life becuase I can eat the same thing day in and day out for a while. And although I would say what I eat is balanced, I do have a tendency to get stuck in food ruts. But I can only eat the same thing for so long, once that craving for something different strikes, its like nothing I’ve been eating is satisfying anymore. Create burgers (I made 5). Cook on medium heat for about 8mins on each side, or until fully cooked (juices should run clear)! Serve over a bed of spinach & sautéed mushrooms & brussels. Why We ❤ Psyllium Husk!